Techsmith’s Camtasia is one of those essential programs for anyone who needs to create interactive content by capturing a live computer screen. That’s what Camtasia’s main job is: to capture live screen actions as video. Simply put, it’s a screen recorder. But it’s also much more than that. Camtasia comes bundled with a powerful video editor, sound editor, and picture-in-picture (PIP) capabilities. 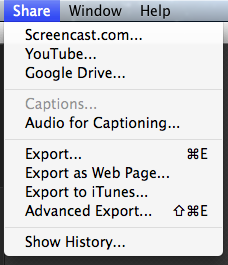 You can also share your videos to Screencast.com, Google Drive, or to YouTube. Note: This review covers Camtasia for Mac version 2.5/2.6. My initial download was 2.5 but has updated since that time. [Late update: Camtasia just updated to version 2.7.1]. Camtasia is available for both Mac and Windows computers and I have used both with equal success. Select a screen recording area. Choose to use your camera or not. The only step in this list that’s more complicated than what I’ve listed here is editing your recording (Step #9). After you stop recording, your recorded footage opens in the Camtasia editor, ready for you to clip, to add effects, to add voiceover, or to do whatever editing you need to do. The editor is very good, but is no match for higher end editing applications. The Camtasia editor isn’t meant to compete with high-end audio/video (A/V) editors, but it does provide you with the tools you need to produce a very high quality video presentation from your screen captures. 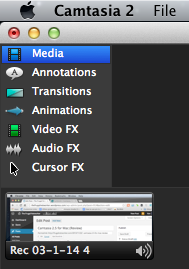 Alternatively, the higher end A/V editors are very difficult to master, but Camtasia’s is not. So, it’s really a trade off. Why it’s frugal: Camtasia for Mac is frugal because there’s no other available professional program of its quality on the market for $99. The $99 price might seem high for a screen capture program, but Camtasia is much more than simple screen capture. It provides you with a professional quality A/V tool and a professional editor at a fraction of the price of buying the two separately. Camtasia is also very easy to use. That ease of use is worth something because it’s difficult to create an application that is user friendly and powerful. Camtasia is both. Techsmith has also surpassed every company I’ve ever dealt with for customer service. The only exception is Intuit, whose customer service is perhaps the best of its kind anywhere. Techsmith’s customer service professionals are well-trained, polite, and absolutely knowledgeable about their products and problem resolution. Simply put; they’re impressive. In my opinion, Techsmith’s Camtasia is the best product of its kind on the market. Coupled with its excellent customer service, it’s a winning combination. It will be the best $99 you’ve ever spent. Recommendation: Buy it. Rely on it.